Chalk this one up to the power of naps. When I was pregnant, I thought for sure I would be able to get through my long to do lists when my not-yet-born daughter would nap. It’s logical; in the pre-baby world, an uninterrupted block of time means the chance to write a few emails, tidy up a workspace or make a few phone calls. However, I quickly learned that those precious nap moments are taken up by attempting to tackle the incredible backlog of things I couldn’t get to in the previous few hours, days, weeks (months?!). I found myself wondering at what point sending a thank you note could be actually rude given the time that’s passed since the gift was given, for example. Anyway, now that we’re on a solid twice daily nap schedule and I’ve completed or written off many of those backlogged tasks, I accomplished the dream – I made this entire recipe (short of the baking time), during an epic morning nap last week. So you should know that the recipe is not difficult and can be done, at a brisk pace while looking back and forth at a baby monitor, in about an hour. Slicing the rhubarb and strawberries in advance would cut down the time a little as well. 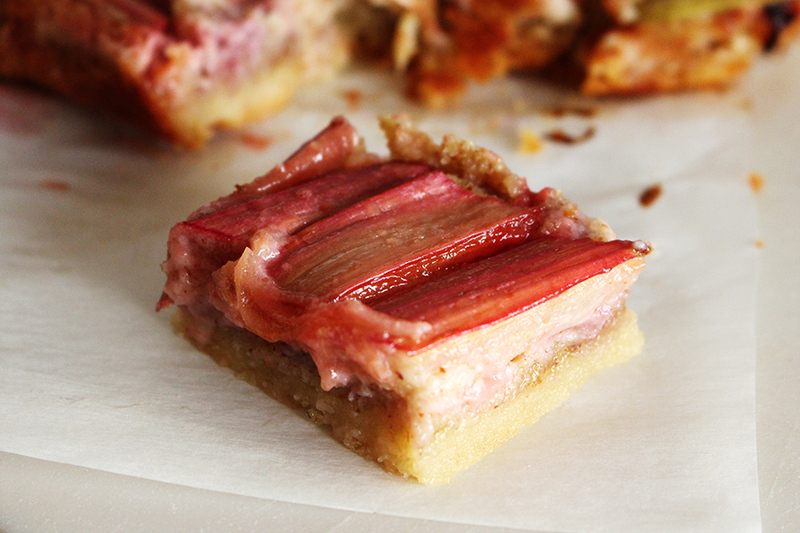 I first saw this recipe on Smitten Kitchen and fell in love with the beautiful ombre chevron pattern of rhubarb. My patience wore thin (baby was going to wake up soon!) when arranging the rhubarb, so I opted for a more simple arrangement, still keeping with the ombre from light green to pink, which was surprisingly easy to accomplish. I added in strawberry because I just love the two flavors of strawberry and rhubarb together, but you could leave that out to really let the rhubarb shine. Preheat oven to 350 degrees and line an 8" x 8" pan with parchment paper (I use two sheets overlapping). In a food processor, combine the ingredients for the crust: flour, salt, sugar, and butter (cut into cubes). Process until the mixture resembles clumped wet sand, about 30 seconds to 1 minute. Pour the dough into the lined pan and press to make an even layer, coming up about 1/4" along the sides. Bake for 15 minutes until just golden (check after 12 minutes if your oven runs hot like mine, it's best for this not to brown too much). Let cool or, to speed up the process if, say, your baby may wake up from a nap soon, transfer to the freezer). Make the filling by adding almonds, flour, salt and sugar to the food processor (no need to clean the bowl). Process until powdery and the almonds are finely ground. Cut the butter into cubes and add to the food processor and process until well combined. Add egg and almond extract and mix until just incorporated. Spread the filling evenly over the cooled crust. Cut the rhubarb in half lengthwise (if your stalks are particularly large you may want to cut them down the middle a second time), and on the bias in 1" slices. Arrange strawberry slices to cover the filling, then cover with rhubarb, starting with more green pieces and ending with more pink pieces, if desired. Sprinkle with sugar and bake 45-55 minutes until a toothpick inserted in the filling comes out clean. Let cool and slice into small bars (hint - it's easier to slice where the rhubarb slices end, not through them as they break apart a bit).